Northants Under-14’s Boys team showed their battling qualities with a stunning 11 holes to nine victory against Leicestershire in a friendly at Peterborough Milton. Although the visitors took the opening tie by five holes and led the second game by six holes with just two to play, the Northants duo of Jacob Williams and Elliot Strickland won the 17th and 18th to cut the deficit. 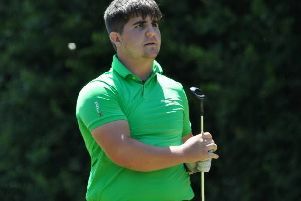 The momentum stayed with the hosts as they clinched the next match by four holes, thanks to a brilliant tap-in birdie for Kai Raymond and partner Harry Smith down the last. Northants completed the breathtaking comeback in style as debutants Morgan Cresswell and Oscar Bell romped to a seven-hole victory in the final tie. Northants Girls team were also successful in their last friendly of the year as they beat Bedfordshire 3-1 at Whittlebury Park. Wellingborough secured their first Scratch League Division One crown for 33 years after grabbing a 4-4 draw at defending champions Northants County in their last fixture. Needing to avoid a two-point defeat to clinch top spot, Wellingborough made an excellent start as Chris Howes and Dominic Holden grabbed the first two points. County responded with wins from Luis Witherall, Joe Quinn and Ben Jones, but Ryan Connolly levelled up the score with a 2&1 success. Although Liam McNeela took the next tie for the hosts by winning the 18th, former county champion Mark Davis kept his nerve to seal Wellingborough’s third Scratch crown, and first since 1984, with a 2&1 victory in the remaining match. Overstone Park ended a solid season with a second away victory as they edged past Northampton by a single point, thanks to wins from Andrew MacDonald, Richard Dalton, Luke Barney and Mikey Chambers, plus a half from Ryan Genner. Priors Hall couldn’t collect their first victory of the season as they crashed to an eighth defeat in nine outings as they went down by a single point at home to Peterborough Milton. In division two, Kingsthorpe’s hopes of completing their promotion-winning season with a perfect record were ended in their penultimate outing as they lost by a single point at Cold Ashby. After being successful in their previous eight fixtures, Kingsthorpe made a positive start as they won three of the first five games, and halved another. Ashby proved too strong in the last three ties however as Stuart Nicholas, Graham Bott and Fraser Carnihan recorded comfortable wins. In division three, Kettering gained promotion into the second tier after closest rivals Collingtree Park lost 5-3 at bottom side Stoke Albany. Needing a win to overtake Kettering at the top of the standings, the visitors made a poor start as Rob Maguire and Steve Holmes took the opening two games for Stoke. Although Collingtree rallied by clinching the next three points, Stoke secured their first victory of the campaign, thanks to wins from Chris Spence, Andy Fotheringham and Graeme Eadie. Northampton secured third spot in the Ladies Intermediate League behind champions Overstone and second placed Northants County after beating Wellingborough 2-1 in their last game. Leah Ribano recorded a convincing 7&6 victory, before Claire Lindsay wrapped up the win with a 3&2 success. Northants County’s Paul Shrives, Brian O’Connell and Paul Fitzgerald (pictured) were the trio to beat in the NGL Izzard Team trophy at Collingtree Park. They carded a combined total of 89 points to finish three ahead of the home team of Mark Spring, Alistair Biggin and Ricky Weal. Former county champion Mark Davis (Wellingborough) bagged the individual plaudits. Northampton’s Lorraine Gilder clinched the gross prize in the County Ladies Seniors Championship at Whittlebury Park. A strong start proved decisive as a score of 82 kept her four ahead of Carol Gibbs (Wellingborough), with Charlie Astbury (Northampton) two shots further back in third. Ida Jane Huggins covered the first four holes on the back nine in gross level par as the 15-handicapper took the net honours on countback from Gilder on net 75. In the Ladies Tazza Trophy, Danielle Edwards made the most of local knowledge as she lifted the Tazza Trophy on her home course. The 30-handicapper carded 33 points to finish clear of Susan Evans (Overstone) and fellow Wellingborough member Barbara Hignett, who took second and third respectively. Two net eagles on the front nine and three net birdies in the last six holes helped Ben Hawkins (Northampton) and Irene McGowan (Kingsthorpe) win the County Mixed Fourball Betterball title at Rushden. The duo grabbed 42 points to finish one ahead of Amanda Rawson and Rawson (both Wellingborough). Carol Collins (Kingsthorpe) and Lee Arnold (Northampton) and the Wellingborough combination of Rod Gibbs and Carol Gibbs also carded 41 to finish third and fourth respectively. Lara Auld (Northampton) collected the Roses Autumn Cup after posting the leading mark of 32 points at Hellidon Lakes. Gracie Murray (Kettering) grabbed second spot by one from Jade Potter, Chelsey Sharp, Sophie Copson and Hannah Talbot. A magnificent par three on the closing hole sealed victory for Overstone Park’s Martha Pieterse in the Roses Autumn Fun Competition. Emily Nunn and Abbie Thompson were second and third respectively. Overstone Park sisters Amy Nunn and Emily Nunn won the County Girls Matchplay Pairs crown with a 2&1 victory over Peterborough Milton’s Lisa Johnston and Megan Chandler in the final at Rushden.